The Lumia series, the hallmark Windows Phone devices by Nokia, so far were left out in the cold as regards the Wireless Hotspot functionality. Every other WP smartphone has been enjoying that since the update to Mango, but not the Lumias. Previously, we've caught wind of rumors that the about-to-be released Nokia Lumia 610 finally has that feature. 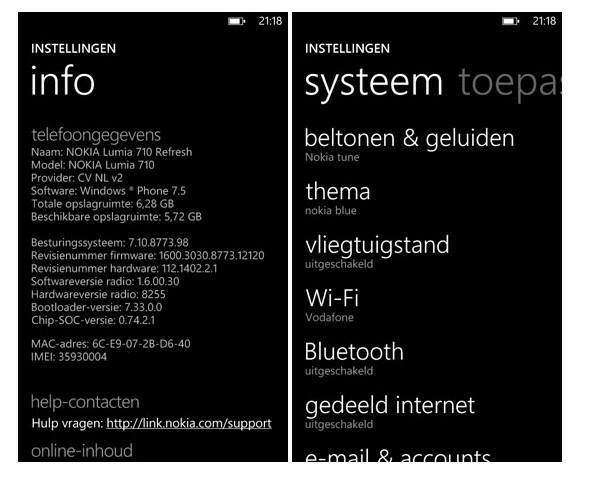 Now user reports suggest that the Lumia 710 and 800 will also have that featured enabled once the new Tango (WP7.5 refresh) update becomes public. So far, only pre-release firmwares have been out and about via the NaviFirm application. Navifirm acquires the firmware files directly from Nokia support servers so those are the real deal. The words "Gedeeld Internet" in the screenshots above mean Internet sharing in Dutch. Another thing is that a changelog for one of the firmwares on NaviFirm lists "Tethering or internet sharing ability" as coming with Windows Phone Tango. Do you have wireless hotspot on your phones and do you use it often? Using this feature on android very often. Shame Nokia still lacks this feature. well, my galaxy 5 had it, and i used unregularly, my 710 (brazil) does not have it yet and i miss it, mostly cos my wife bought a New Ipad (wifi) so... It would made a big difference.